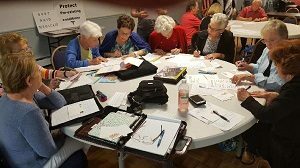 Indivisible of Monroe members write post cards and sign petitions to be delivered to legislators in protest of the healthcare bill currently before the US Senate. The group, a local grassroots, nonpartisan political action organization, met this week at the Knight of Columbus in Jamesburg for a marathon working session on this critical issue and a discussion to prioritize issues for future efforts. The organization is part of a larger grassroots citizen’s movement that took root after the presidential election with the goal of effecting change through political action. The Monroe group is unique in that its membership is almost entirely senior citizens who have become re-engaged in the political process. Membership is free and open to the public.